It's as if a hole has been created, Dumbledore's dead!! He shall be missed. Those of you who still think that the man to whom "death is the next great adventure" died pleading for mercy, you need to go read these. Overall, the book was good, had some really funny chapters and also leaves us, yet again, with loads to ponder over. However, to me it seems quite certain that R.A.B. is Regulus 'A.' Black, and 'a heavy locket that none of them could open' while cleaning The Noble and Most Ancient house of Blacks, is the one Harry and Dumbledore had gone out looking for. woooh........ i never thought of that locket at the house!!!!!! ingenious pal...n even the R.A.B. too koool....... it was really sad that dumbledore is dead... but his time had come...n he died a noble way.. atleast if it fits all the theories..reading all those theories n even i felt the same that he,'the greatest wizard in history' would beg 4 mercy, could not fit into the picture...i better read thru the old volumes...awesome work...new eye opener. oh i almost forgot....too good a pic ;) its sad how india is getting polluted day n day....we wouldnt have such an orange sky if it wasnt for all the dust that contibutes to it... but a really good shot i must say. Glad you liked it. The increasing, uncontrolled pollution was what I was trying to point out through this one, and would also have written about it had I not been overtaken by a much bigger sorrow of Dumbledore's death. Oops! Thanks for pointing it out. Y da fuk is everyone so upset abt this Dumbledore guy. Let the oldie die in peace yaar ! Waise nice pic, where did you take this one ? actually rungta about the coment............. hmmm 4get it too lazy 2 give a coment.any other time. 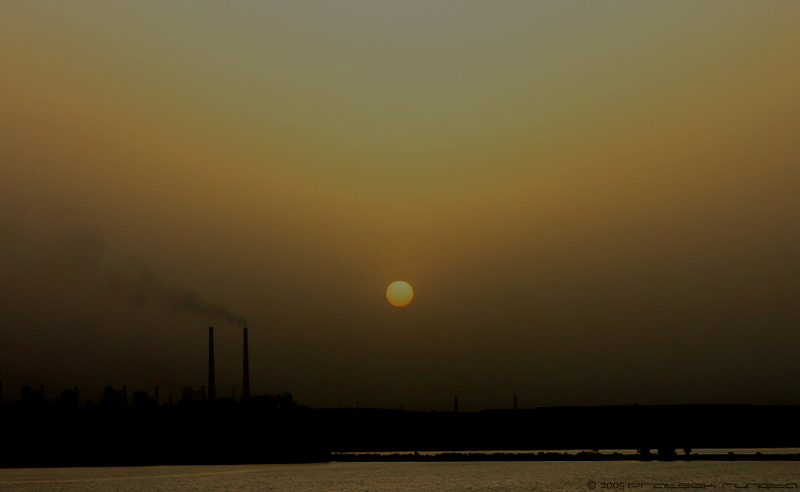 I took this picture at Bokaro and what you see is the Bokaro steel plant behing Cooling pond No.2. never will we see him again or hear him for he has been erased from the phase of this world , that which caused the utmost pain , the pain and realisation of inexistence that leaves my heart to ponder the harsh reality and meaning of life !! Nice gradient that you've captured in that sky. And the silhouette of the factory from which the smoke is rising looks good too. At first I thought the water was sand, but those are the brilliant parts of a photograph. the last book will have Aberforth, Dumbledore's brother who works at the Hog's head.. So it will Vega but I'm missing your point (if you were trying to point to something in the first place that is). what point? no no, I wasn't pointing anythin..or was I? I don't remember.